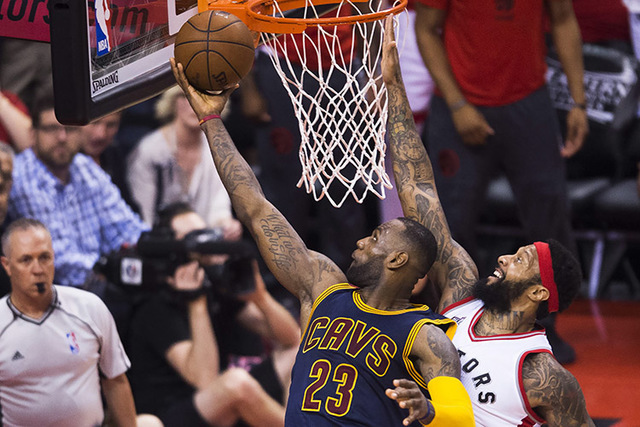 For LeBron James, it’s six straight trips to the NBA Finals. Maybe this one will end Cleveland’s long wait for a championship. 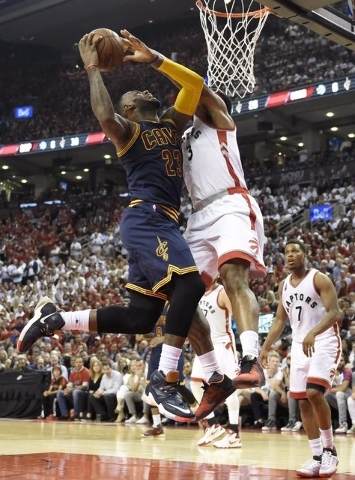 TORONTO — For LeBron James, it’s six straight trips to the NBA Finals. Maybe this one will end Cleveland’s long wait for a championship. 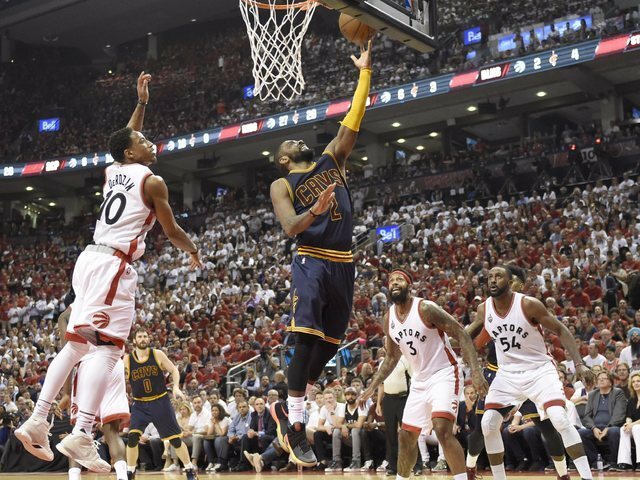 James scored 33 points, Kevin Love had 20 points and 12 rebounds, and the Cavaliers advanced to their second straight finals by beating the Toronto Raptors 113-87 in Game 6 of the Eastern Conference finals Friday night. The Cavs will be seeking to end Cleveland’s 52-year championship drought, the longest by any city with at least three professional teams. No Cleveland team has won it all since the Browns blanked Baltimore 27-0 to win the NFL championship in 1964. James, who grew up in nearby Akron, is well aware of what a championship would mean to Cleveland. Cleveland would open at home against the Thunder but would be on the road against the 73-win Warriors, who trail 3-2 against Oklahoma City heading into Saturday’s Game 6. It’s the third finals appearance in team history for the Cavaliers. Cleveland lost to Golden State in six games last year and got swept by San Antonio in 2007. 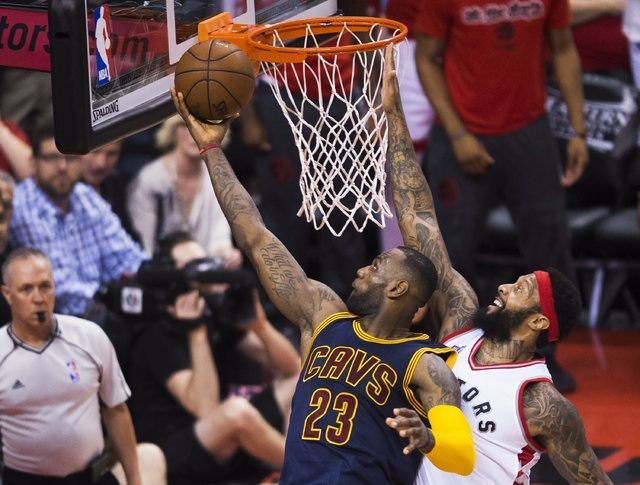 James broke the 30-point barrier for the first time this postseason and finished with 11 rebounds and six assists. “We needed LeBron to set the tone for us early and I thought he did that,” Lue said. James played in four straight finals with Miami before returning to Cleveland. He will be the eighth player in NBA history to appear in six consecutive finals and the first who didn’t play for the Boston Celtics. After a second-quarter dunk, James shared some verbal barbs with rapper Drake, the Raptors’ global ambassador and the man who popularized the nickname ‘6ix’ for Toronto. Kyle Lowry scored 35 points and DeMar DeRozan had 20 as the deepest playoff run in Raptors team history ended, much to the disappointment of a sellout crowd of 20,605 dressed in red and white T-shirts that formed a maple leaf pattern on either side of the court. Fans stood and cheered “Let’s go, Raptors! Let’s go, Raptors!” throughout most of the final three minutes. Raptors coach Dwane Casey said reaching the conference finals was “a tremendous learning experience” for his young team, one that’s “a step ahead” in its process of becoming a championship contender. A dejected Lowry said it was hard to see the positive side of Toronto’s best season ever. James scored 14 in the first and five of Cleveland’s nine field goals were from long range as the Cavaliers led 31-25 after one. 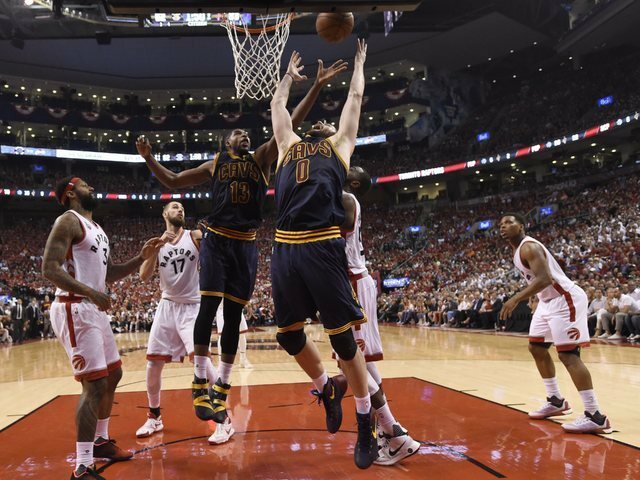 The Cavaliers made 10 of 15 3-point attempts in the first half, while Toronto was 2 of 12. Blue Jays outfielder Jose Bautista and Montreal Canadiens defenseman P.K. Subban watched from courtside seats, while actor Jamie Foxx sat in a private suite. Cavaliers: Shot 17 for 31 from 3-point range. … Outscored Toronto 17-5 in fast break points. 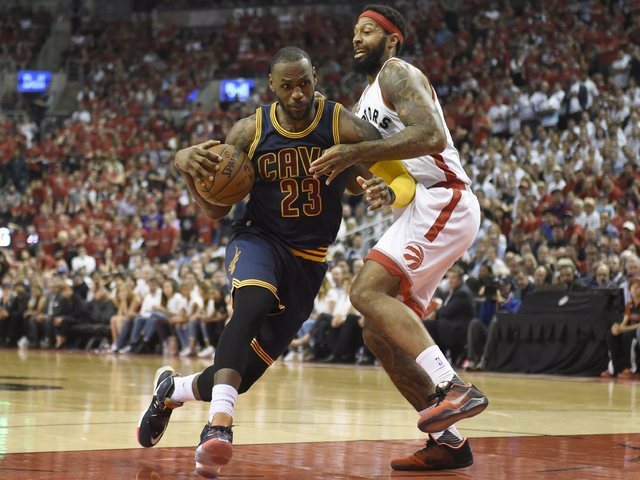 Raptors: Finished their playoff run by playing every other day from April 29 onward, a 15-game run that started with Game 6 of the first round against Indiana.